Quantified Ag, a company specializing in IoT cattle tracking and cattle health solutions, has implemented Semtech’s LoRa devices and Technology into its smart cattle tags for advanced health monitoring. Quantified Ag’s devices are implemented in feedlots in the U.S. and Australia. 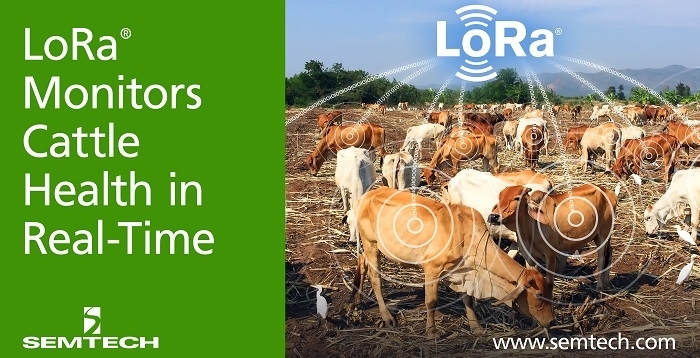 According to Vishal Singh, CEO of Quantified Ag, Semtech’s LoRa Technology allows them to respond much faster to cattle disease than conventional techniques. Communications throughout the day from an individual animal’s smart ear tag minimize the delay from when the animal contracts an illness to when it starts showing symptoms, which improves a cattle producer’s business model and increases productivity. The company has thus seen significant results in increased efficiency.